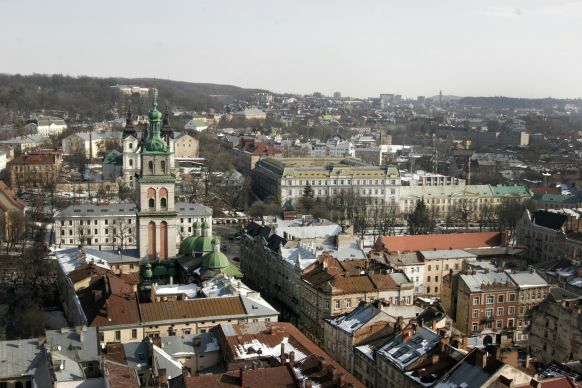 The skyline of L’viv, Ukraine. German United Methodists recently called upon their government to work for negotiations, rather than military action, in the conflict between Russia and Ukraine. United Methodists in Germany are encouraging their government to work toward a negotiated, peaceful settlement of the dispute between Russia and Ukraine. An open letter sent earlier this month to Angela Merkel, the federal chancellor of Germany, and to Frank-Walter Steinmeier, the federal foreign minister, expressed concern about politicians and those in the media demanding action against Russia. “Through such wording, we fear the preparation for the ground of approval of military solutions in the conflict in Ukraine and beyond,” stated the English translation of the resolution adopted by the United Methodist Germany South Annual Conference during its May 28-June 1 meeting in Stuttgart. Bishop Rosemarie Wenner leads the Germany episocopal area. After street protests help bring about a change in the Ukrainian government earlier this year, Russia annexed the Crimean peninsula and has been accused of supplying weapons to separatists in eastern Ukraine. According to a June 26 Reuters report, Merkel called Russian President Vladimir Putin for a second time in two days to try to find a way to prolong the Ukrainian government’s ceasefire, due to expire June 27. The letter to the German federal government invokes the United Methodist Social Principles and the belief that war is “incompatible” with Christ’s teachings. “German United Methodists take with greatest seriousness our church’s formal rejection of military action as a means of dealing with political differences and border disputes between nations,” Kemper said. German government officials must distance themselves “from calls for military reorientation and the armament of the NATO,” the letter said, and work diplomatically to de-escalate the situation by ceasing all hostilities immediately, vacating public buildings and involving all sides of the conflict in negotiations and an active dialogue process. “In this politically conflicting time, the church continues to share the gospel way – the way of active ministry to people, preaching of hope and faith, proclamation of God’s power and providence in the history of humankind,” Khegay wrote in a public prayer in March.